Salvation Army Hall at Bridgeton Cross. I was delighted to receive these 3 postcards from him on Sept 2004, postcards his parents had lovingly kept. 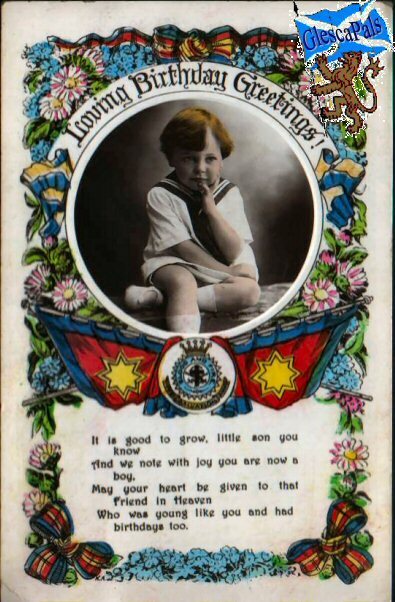 Note the children on the photographs were unknown.... well.....see below. 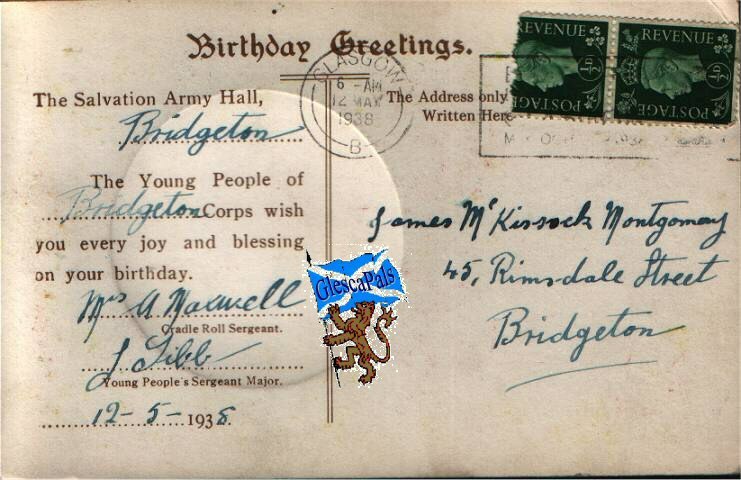 This is the reverse of the 12 May 1938 postcard above, sent by the Salvation Army to young James McKissock Montgomery whose family lived at 45 Rimsdale Street, Bridgeton. 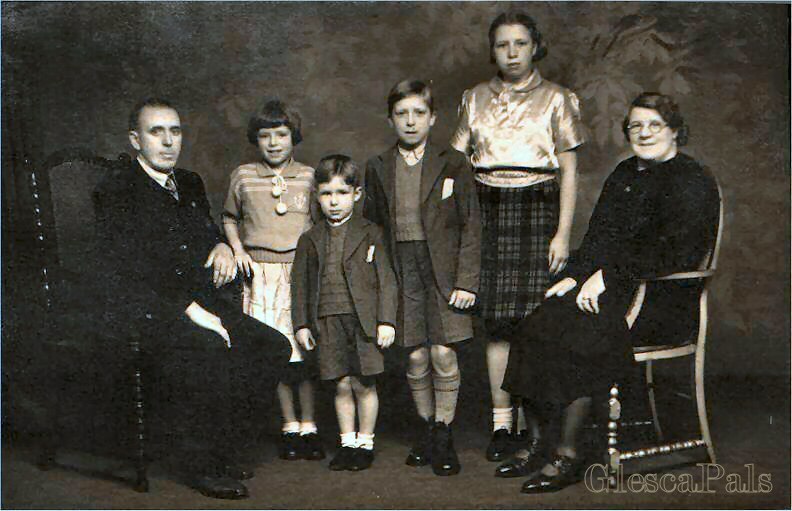 See below a photograph of the Montgomery family taken c1940. Hi - I have had a lot of fun looking over the pages of GlesgaPals. My mother came from Bridgeton, so many of these stories have impact. There are a lot of stories I could add, of earlier times, as my mother was born in 1888. ........... you show three Cradle Roll cards that were sent to the Montogomery child when he was one, two and three. 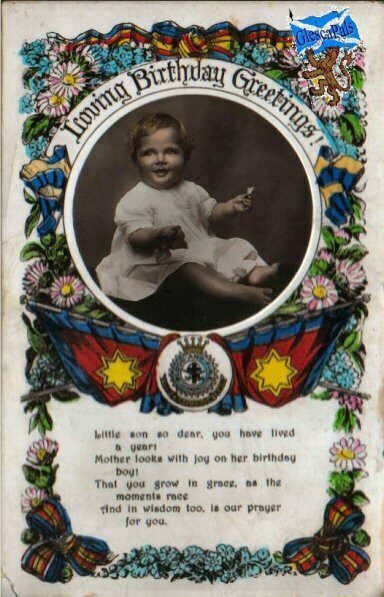 My mother was Cradle Roll Sergeant in Weston Corps in Winnipeg, Canada and used to give out these cards. 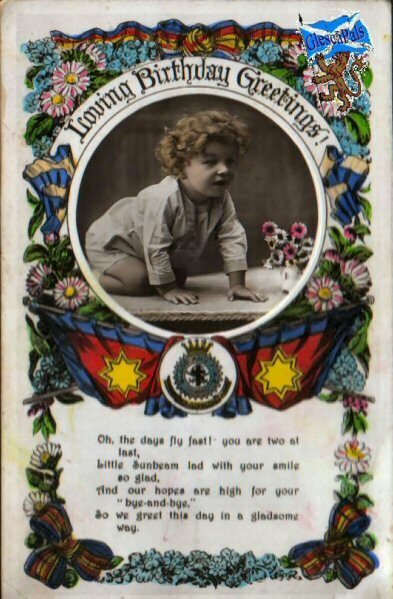 How well I remember them, as they were so beautiful, with tints of mauve, pink and blue, with the picture of the child on the card on a raised rounded portion of the card. That was in the 1930's. It was mentioned that you did not know the names of the children portrayed. Young Jim Montgomery, is around 5 yrs old in this photo. this year (2005), he was delighted.